Hello all. Welcome to my little place on the Web, Mrs. Lincolns Inkin! Today's share could be used as so many things. It could be used as a masculine card, a thank you card, a hello card or even a Christmas Card (if you added some glitter to the tree). I love cards that if you didn't put a sentiment on them right away, they are great "go to" cards for whatever the occasion may be. 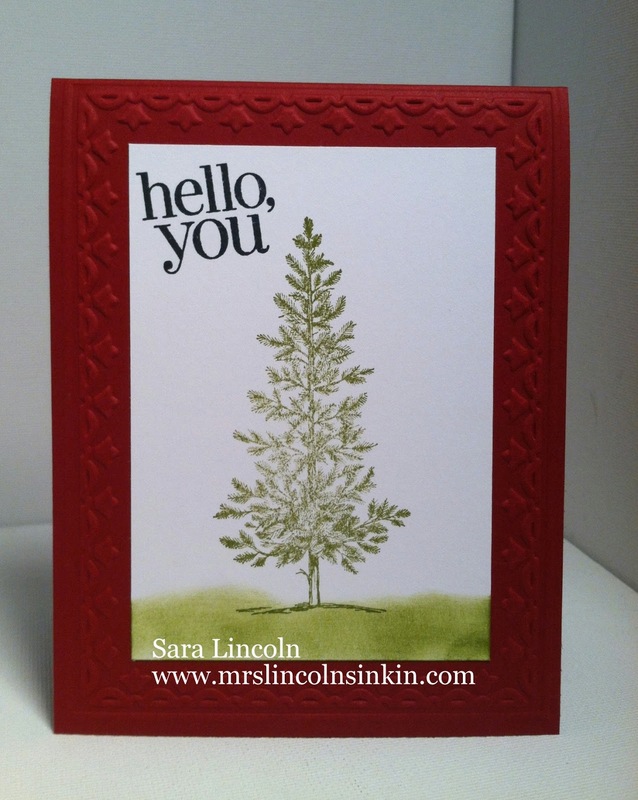 Today, i made this a simple "hello" card using the sentiment "hello, you" from the Regarding Dahlias set. The base of my card today is average size of 4 1/4" x 5 1/2". I chose to go with the Cherry Cobbler because i think that it just really makes the Whisper White card stock POP! I outlined the edges with my card with the Framed Tulip embossing folder and my Big Shot.